The Ferruginous Hawk (Buteo regalis) is truly a regal bird. Sporting a 56 inch wingspan, it is the largest of the Buteos. They inhabit the grasslands, shrub steppes, and deserts of western and central North America. Click on photos for full sized images. 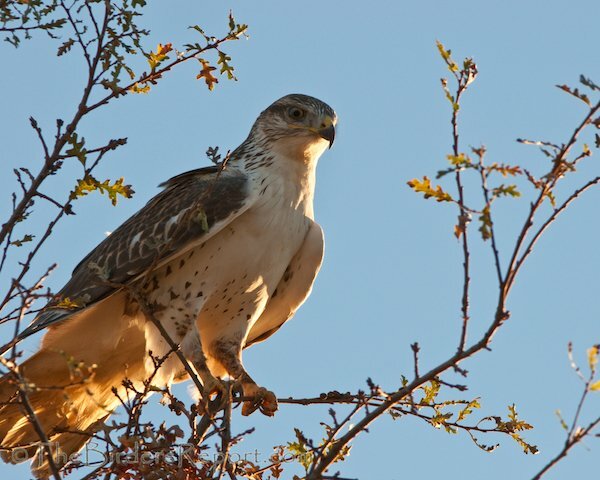 Ferruginous Hawks were known as Rusty Squirrel-Hawks back in the 1800’s and they exist in both a light and dark morph. 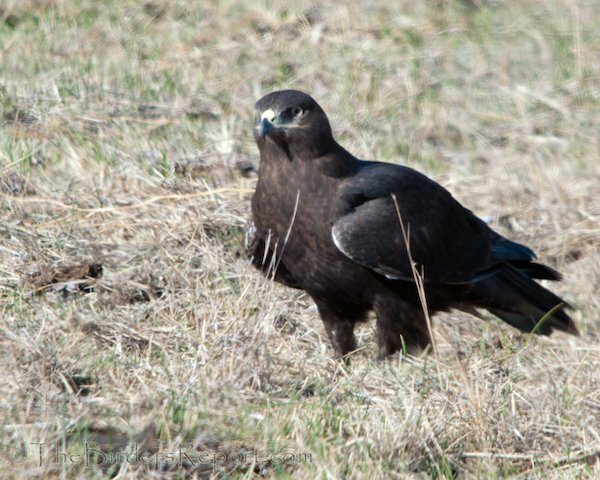 I took a ride up to the Fall River Valley back in October and spotted both morphs in the large grasslands where we also usually see Rough-legged Hawks and Prairie Falcons. This is the light morph. They are often seen on the ground since their prey consists mainly of rabbit, prairie dog and, you guessed it, ground squirrel. 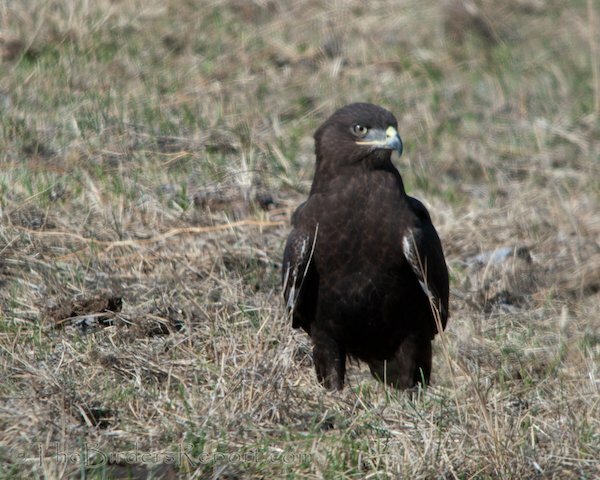 And this is what the dark morph looks like. Note the long yellow gape, a characteristic field mark of this species. For the past five years I have been fortunate to have a Ferruginous Hawk wintering near a farm in a grassland area below the foothills where I live. 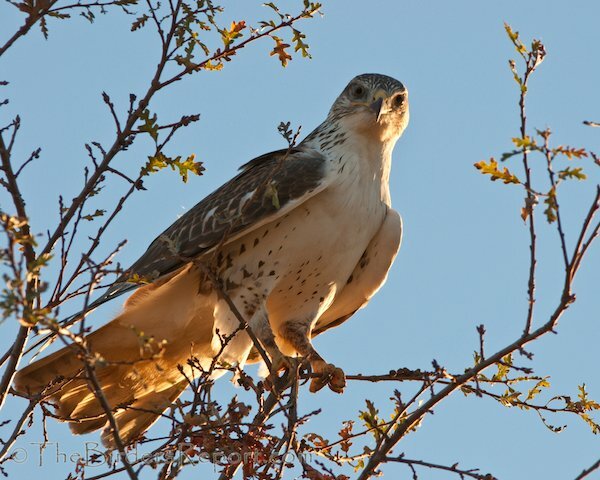 Ferruginous Hawks were petitioned for listing under the federal Endangered Species Act in 1991 but rejected; currently they are listed as a Category 2 Species by the U.S. Fish and Wildlife Service and as a Sensitive Species by the Bureau of Land Management1. They are listed as vulnerable in Canada. A study conducted by Richard Olendorff, working for the U.S. Bureau of Land Management, suggested that management measures aimed at maintaining current population numbers should include enhancing nest substrates, maintaining prey populations, and mitigating development impacts from mining, pipeline construction, and urbanization2. Obviously more research needs to be done on this magnificent raptor. The latest study I found was a migration study which included Canada, the United States and Mexico done by the Rocky Mountain Bird Observatory. I hope to see my winter visitor for many years to come as these birds can live 20 years in the wild! 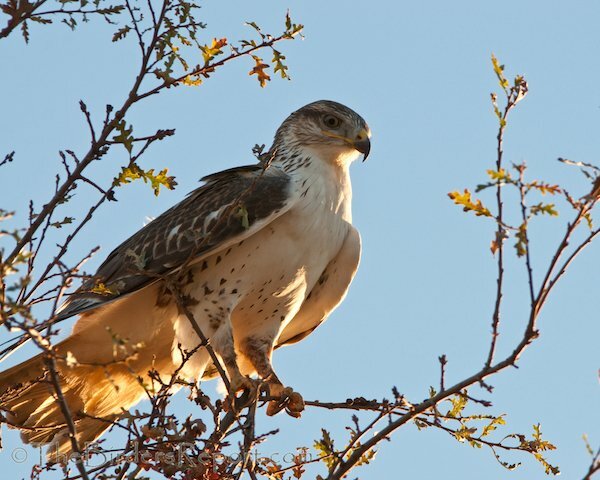 In the meantime, I found a cool video of the Ferruginous Hawk in slow motion. It is an education bird from the Arizona-Sonora Desert Museum’s Raptor Free Flight program. Enjoy! References: 1Birds of North America Online, 2Olendorff, R. R. 1993. Status, biology, and management of Ferruginous Hawks: a review. Raptor Res. and Tech. Asst. Cen., Spec. Rep. U.S. Dep. Interior, Bur. Land Manage. Boise, ID. 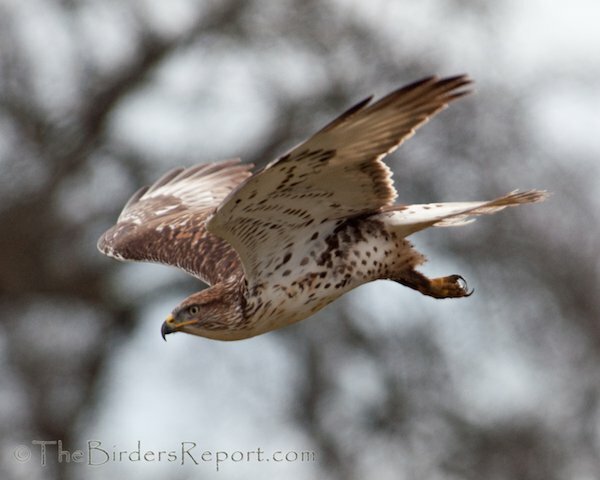 How lucky you are to have this magnificent raptor species in your neighborhood! Great pictures – having a dark morph must make it even harder to ID these species! @Pat I agree! I hope we can keep enough wild rabbit, squirrel and prairie dog in our habitat to keep this beautiful raptor species healthy and thriving. @Mary, thank you very much. This is actually 10000 Birds blog, I am but a Beat Writer for this iconic birding blog! 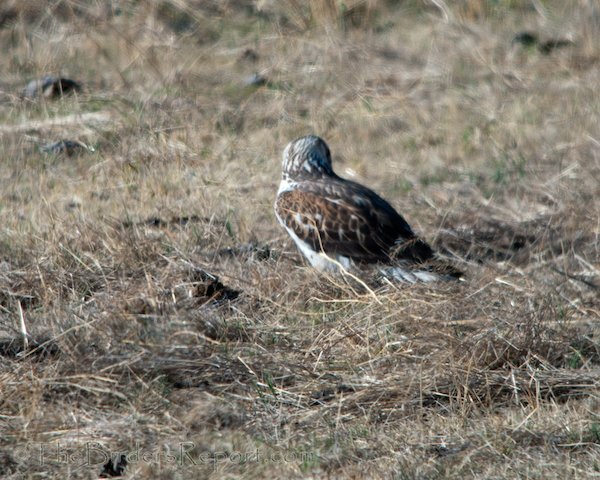 I saw Ferruginous Hawks for the first time back in January when I spent a day birding in California’s Panoche Valley. We saw at least three light morph birds and one rufous morph (a bit lighter and obviously redder than the dark bird pictured here). I could easily have spent all day watching those hawks if there hadn’t been so many other interesting birds to find. @Katrina it sounds like you had a great day in Panoche Valley! Hopefully you were able to see some Burrowing Owls? Such a magnificent bird. Awesome captures and info, Larry. Another good post Larry, keep up the good work! @Larry – I did have a wonderful day in the Panoche Valley. I saw one Burrowing Owl there. The other stars of the day were the 13 Mountain Plovers that we spotted after much looking.